The top three players in the global psoriasis treatment market accounted for over 49% of the overall revenue generation in 2016, indicating a largely fragmented nature of this market. These three players, namely Johnson & Johnson, Amgen Inc., and AbbVie Inc., dominated the market in terms of supply of psoriasis treatment products. Transparency Market Research (TMR) observes that these players will pay special attention to pipeline enrichment through research and development activities in order to maintain their position in the market in the forthcoming years. “Many of psoriasis biologics offered by prominent players will go off-patent over the coming years. Patent expiration will lead to the introduction of new biosimilars. This will intensify competitive rivalry in the market,” says the author of the report. The opportunity in the global psoriasis market was worth US$8.12 bn in 2016 and is poised to rise to US$12.06 bn by 2024, expanding at a CAGR of 5.1% therein. On the basis of product, the market will be led by TNF inhibitors until 2024. The segment is expected to account for 47.1% of the overall market revenue, with its growth attributable to their superior efficacy and safety. The interleukin blockers segment is anticipated to exhibit a CAGR of 7.4% during the same period. North America will continue to be the dominant regional market until 2024, representing 61.3% of the overall market. The growth of the region is supplemented by the growing prevalence of psoriasis disease and high consumer spending on healthcare. Owing to these factors, the region is estimated to post a CAGR of 5.9% during the review period. The U.S. will be at the forefront of the growth of the region. 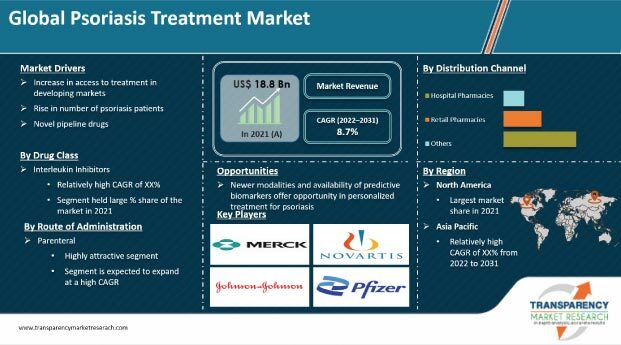 The approval of new biologics, along with the presence of novel drugs in the pipeline, is providing a significant momentum to the global psoriasis market. “Biologics facilitate the management of moderate to severe psoriasis by providing enhanced skin clearance, control of symptoms, and quality of life to thousands of individuals affected,” says a TMR analyst. In addition, many drug classes are competing for the same moderate to severe patient population, which in turn is working in favor of the market. The rising awareness regarding the diseases, along with increasing access to physicians and dermatologists, in developing countries is also influencing the growth of the market positively. Moreover, the rising prevalence of psoriasis disease is augmenting the market. In existing chronic therapies, especially for plaque psoriasis treatment, patients often lose response to the treatment in the middle of the course. Various studies indicate that only 20% to 57% reach a 90% improvement during treatment and responses may be lost over time. This is hampering the growth of the global psoriasis treatment market. Furthermore, the side effects associated with the administration of certain drugs is limiting the widespread adoption of psoriasis treatment. Some of the common side effects are injection site reactions like hardening of the skin, stabbing chest pain, lethargy, cold symptoms, headache, nausea, diarrhea, skin rash or itching; and in some cases, rare risk of developing cancer.